Thank you for stopping by with your happy anniversary wishes, I was blown away by your comments! 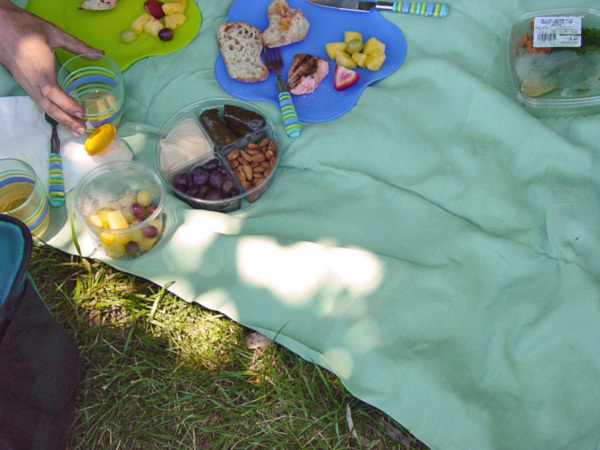 Yesterday we had a super picnic on the expansive front lawn of the Nelson Atkins Museum of Art. It was delicious and then we spent three hours looking at art inside the museum. In addition to the Nelson's permanent collections we saw the print show and the sparks show. My head is still fluttering around and connecting ideas that I had while walking around the museum. Then we went to the Plaza, into Papersource, and ate dinner out. It was a gorgeous day and I feel I'm still in that mindset today. This morning I did manage to complete the finishing touches on an eight [piece] [pinhole] [commission] that I'd been working on a while for a buyer. Whew! I feel like I accomplished something in doing so. Collectors like that come along so rarely, what a gem! Now I MUST go try to accomplish something in our garden, in the battle against the weeds. I feel a little defeated there. Ok, a LOT defeated. Except, our broccoli is fantastic this year, and I took a picture I was going to show you, but I think my camera ate it. pooey. ok, I hope your weekend was fabulous in all the fun things you did!